Are you sure you want to remove The history of the rebellion and civil wars in England from your list? The history of the Rebellion and Civil Wars in England: begun in the year 1641, Re-edited from a fresh collation of the original MS. in the Bodleian Library. 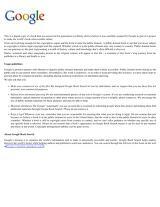 The history of the rebellion and civil wars in England: together with an historical view of the affairs of Ireland. in English - A new ed., from the original manuscript. 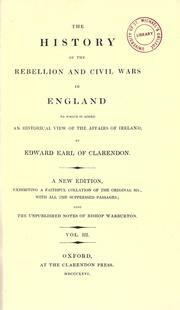 The history of the rebellion and civil wars in England: to which is added an historical view of the affairs of Ireland. 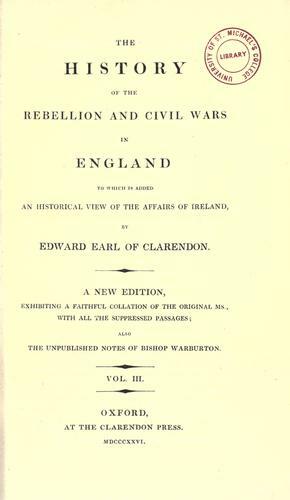 The history of the rebellion and civil wars in England: to which is added an historical view of the affairs of Ireland : a new ed., exhibiting a faithful collation of the original MS., with all the suppressed passages; also unpublished notes of Bp. Warburton. 1731, printed at the Theater, An. Dom. November 21, 2012 Edited by 188.190.125.66 Edited without comment.